Food Safety is not only a term to understand, it’s a full flash management system that is required to be legally approved to ensure that the produced food items are safe for customers to eat. It’s directly related to the handling, preparation and storage of food items in ways to protect eatables from causing food borne illness. A number of procedures are followed to attain the assurance of safe quality of food that is widely acknowledged as Food Safety Management System (FSMS). FSMS provides a systematic approach to identify and prevent food borne illness. A well organized FSMS with appropriate control measures can help food organizations to establish food safety regulations and ensure the prepared food is safe and hygienic to consume from the consumer’s point of view. It not only related to a selected sector; quality of food affects all in the food chain including producers, manufacturers and consumers. FSMS in general refers to a series of routines that should be followed by everyone that is a member of the food chain. In general, it belongs to the implementation and maintenance of Hazard Analysis Critical Control Points (HACCP) that ensures the food produced is safe to eat. HACCP is a well designed regulatory system that is easily adaptable by all types and size of business enforcing the principles of safe food production. 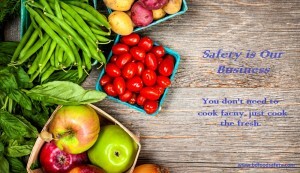 It allows business owners to identify and control any hazards that could pose a danger to the preparation of eatables. It focuses on prevention of diseases and accepted by International authorities as a most effective means of controlling food-borne illness. For a successful HACCP program to be properly implemented, management must be executed to a businesslike perspective. The development and maintenance of business’s HACCP plans are directly determined by adequate training in the application of above principles. ← Join HACCP Training and Get HACCP Certification!